See much more — The Pebble HD with Stand gives expanded magnification ranges from 1.9x to 21.1x to give you extended zoom, magnification and field of view. 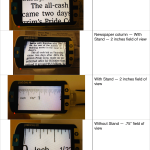 Click here to see a chart of how much more magnification you get when using Pebble HD with Pebble Stand. New Pebble Stand for extra comfort and wider field of view — Pebble HD now has a Pebble Stand that gives you increased field of view and added comfort for longer reading tasks. 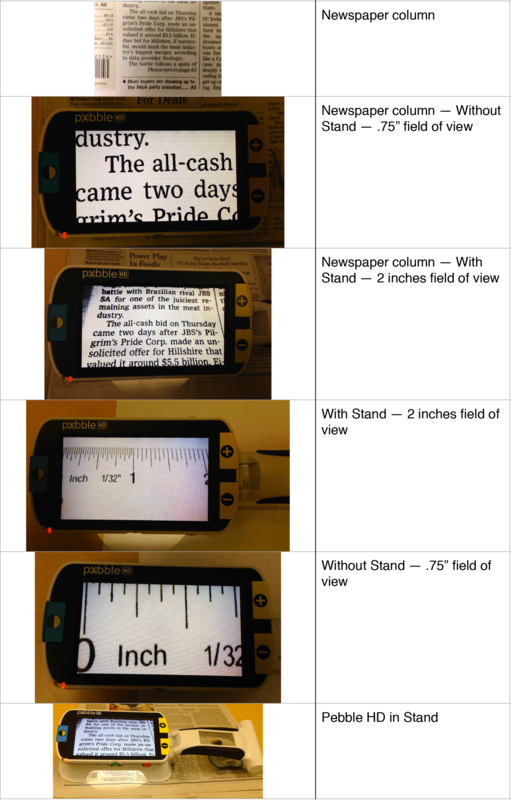 This new stand gives you increased Field of View (3x more) at Low Magnification without having to lift your pebble from the reading surface! Pebble Stand has an ergonomic 20 degree tilt angle that gives you a more comfortable viewing position so you can sit back and relax while reading. Versatile T-shaped handle — Pebble HD comes with a unique T-shaped handle that is perfectly balanced with its lightweight display to put the least amount of stress on your wrist. Use in comfort with lots of positions. T-shaped handle gives you multiple hands-free positions – writing, viewing prescriptions, playing cards, filing a nail, etc. 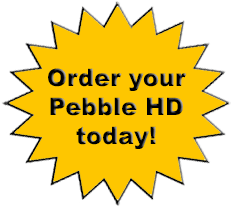 Click here to Order Your Pebble HD Now! 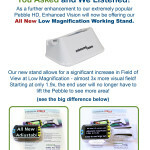 New ergonomic lightweight compact design makes Pebble HD the perfect magnifier whether at home or on the go. Carry this low vision product in your purse, pocket, or clip it on your belt with the included carrying case.